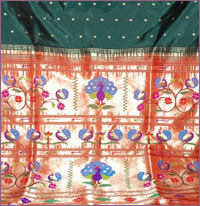 The special love of Peshwas for Paithani in 18th century has endowed a name to Paithani as "Queen Of Sarees". 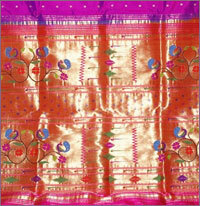 Famous as, "a poem hand woven in silk and gold", Paithani Sarees are for those with discerning and sophisticated taste. 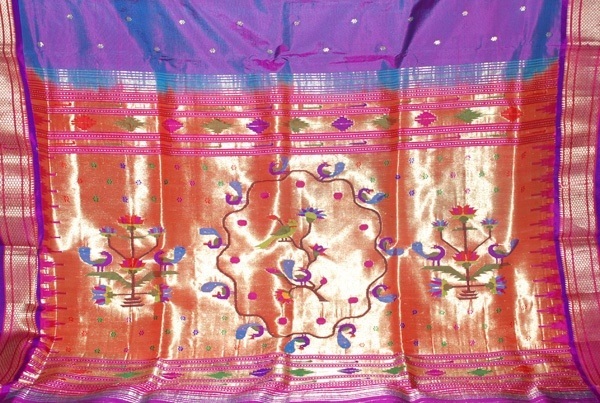 The art of weaving Paithani flourished in 200 B.C., during satvahana era and instantly became famous. They became so popular during this era that it became a tradition for every Maharashtrian woman to own at least one Paithani sari. 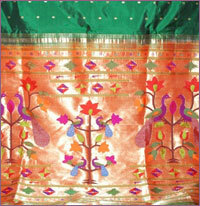 Since then Paithani is coveted in India as a precious heirloom passed on from generation to generation. 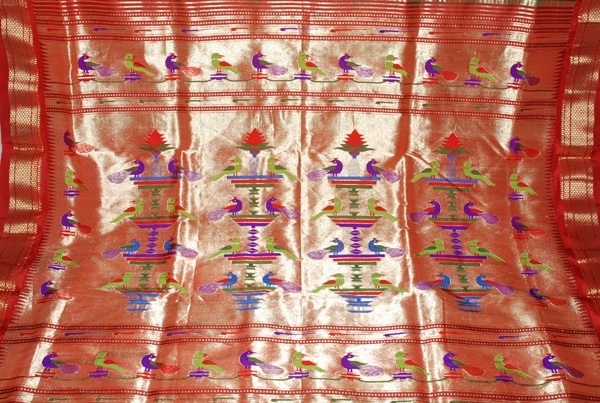 In the early days, Exquisite Silk from Paithani was exported to many countries in exchange for gold and precious stones. It's the shear dedication and faith of the weavers that has kept this tradition still alive. 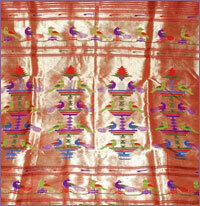 Authentic Paithani is hand woven in pure silk and gold / silver. 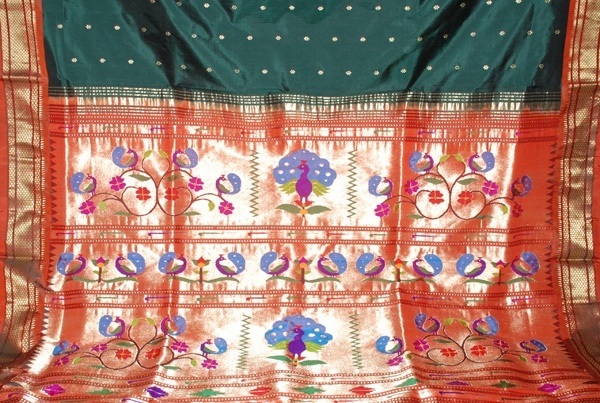 Intricate designs on Pallu and border is a specialty of Paithani sarees. 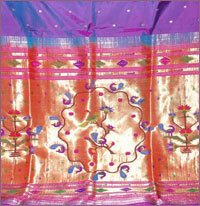 The traditional Paithani saree used to have limited 2 to 3 dark magenta and blue color with different designs. 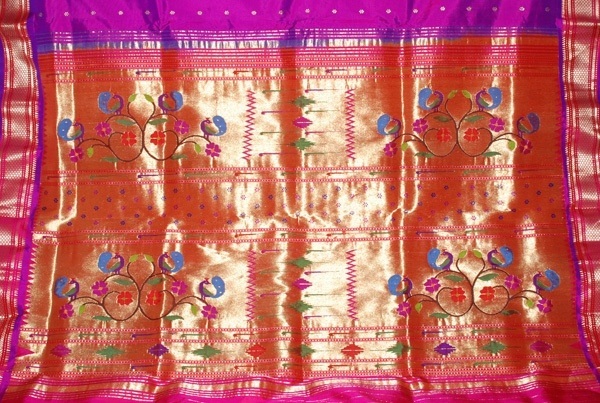 However today Paithani is available in almost 30 to 40 colors with different traditional and modified weaving in Pallu and Border. In the olden days, the Jari used in making Paithani was drawn from Pure Gold. But today Silver is substituted for Gold and in some cases Copper substitutes Silver. Thus making the Paithani more affordable to many People. Making of a Paithani involves only manual techniques and no mechanical means are resorted to weave such wonderful creations. 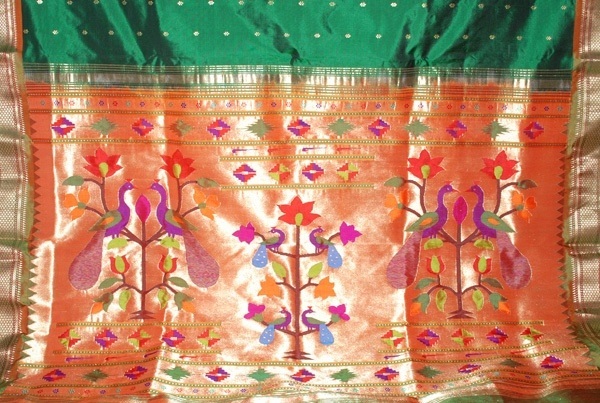 The Paithani is mainly categorized in three different types.